Confirmation Features: TÜV Rheinland Group. Gryyp Line, SL is committed to provide its customers quality and safety products. 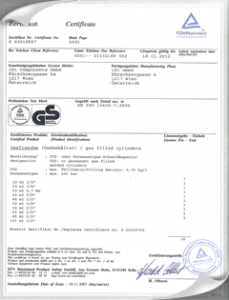 Endorsed by TÜV Rheinland Group, which is a company with international recognition. 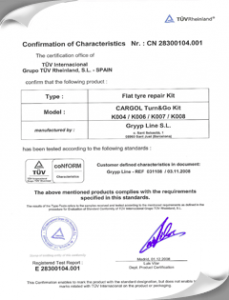 TÜV Rheinland Group is a neutral entity that issues certificates or confirmations of features, according to national or international standards. A norm is a standardized set of rules that includes a catalogue of requirements, proposed by relevant institutions such as manufacturers, consumer associations, legal, research, certification bodies and inspection. To professionalize the process to 100%, it was decided to use one of the facilities located in Spain with international recognition: Applus Idiada Tarragona. 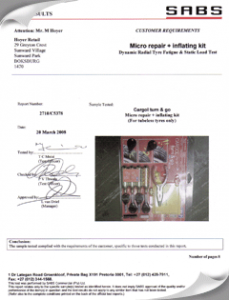 It issues a series of tests, engineering and automotive approvals. 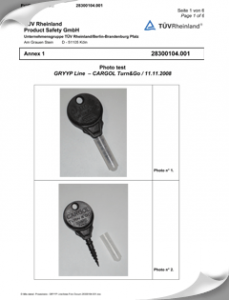 The result is reflected in the documentation issued by TÜV Rheinland Group: Report of tests y photographs. 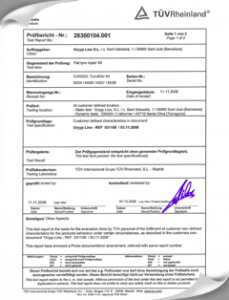 Finally, we successfully obtained the Confirmation of Characteristics Nr: CN 28300104.001, issued by TUV Internacional. 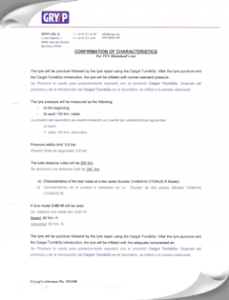 One of the important components of our kits Cargol Turn & Go, are the cartridges of CO2. 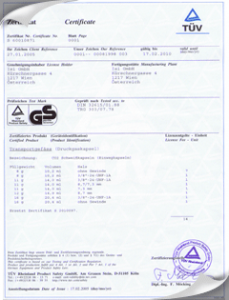 Which are certified by TÜV Rheinland Group.